43 years ago, Peter and Rod would’ve shot Vo Xuan Thu on sight. Now, the Vietnam War veterans are sitting down for beers to plan a new club that will bring former enemies together. BullSh!t! Racists do not have to be part of the bargaining – they are un-American! You can’t make a lasting bargain on immigration without a restrictionist at the table. The company, Devumi, sold at least 55,000 Twitter bots that used personal information taken from real people. Organizations like the Type 1 Diabetes Defense Foundation and the Juvenile Diabetes Research Foundation are fighting to share rebates directly with patients, cutting out a cash cow for the industry. If the rebates are eliminated, US insulin prices begin to look more like those in Canada. But until something changes, Americans like Alec Raeshawn Smith will lose their lives because they can’t afford a 100-year-old drug. Never forget genocides that the world has tolerated. In the first two massacres, Bingel calculated first twenty-four thousand and then twenty-eight thousand Jews were killed. In the third, Ukrainian militia killings, six thousand were murdered. “In the morning at 10.15, wild shooting and terrible human cries reached our ears. At first I failed to grasp what was taking place, but when I approached the window from which I had a broad view over the whole of the town park, the following spectacle unfolded before my eyes and those of my men, who, alerted by the tumult, had meanwhile gathered in my room. A shower of bullets was then fired at this human mass. Those not hit outright were struck down with the swords. “The Last Jew of Vinnitsa” is an iconic photograph picturing the imminent execution of a Jewish man in the vicinity of the Ukrainian town of Vinnytsia during a massacre perpetrated by Nazi SS and Ukrainian militia. The photograph was found from the personal album of an Einsatzgruppen soldier (from Nazi death squad). It is named after the handwritten inscription located at its back. 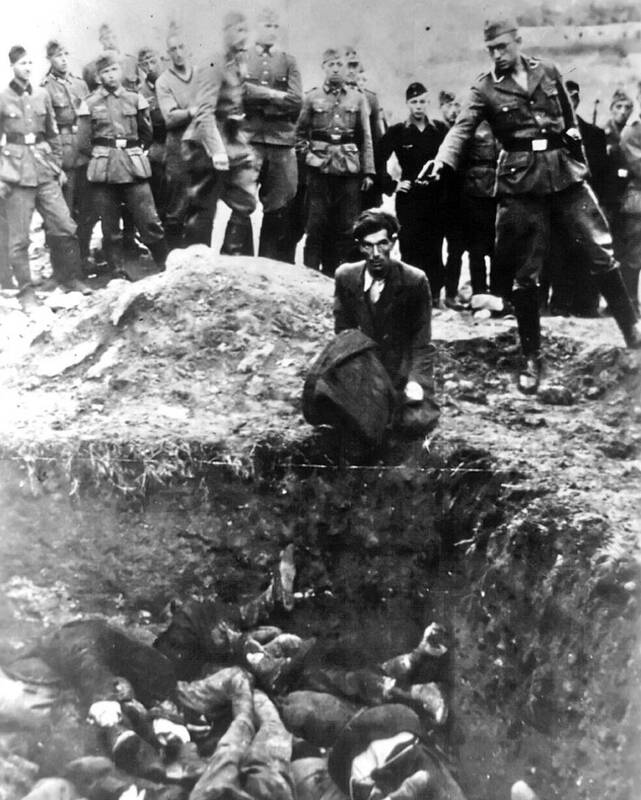 Photograph of the imminent execution of a Jewish man kneeling before a filled mass grave in Vinnytsia, Ukraine, during a massacre perpetrated by Einsatzgruppe D and Ukrainian militia in 1942. The executioner is a member of Einsatzgruppe D, a paramilitary death squad of the Nazi SS. The picture was taken at the third and final massacre at Vinnytsia in 1942, in which Ukrainian militia participated to a greater extent. It is often wrongly dated at 1941, the year in which the two previous massacres took place, which had far higher casualties according to Wehrmacht Lieutenant Erwin Bingel. Unlike what is suggested by the inscription, not all of the Jews of Vinnytsia died in the massacres: a few survived by joining the partisans or by going into hiding. The photograph was found in a photo album belonging to a German soldier. 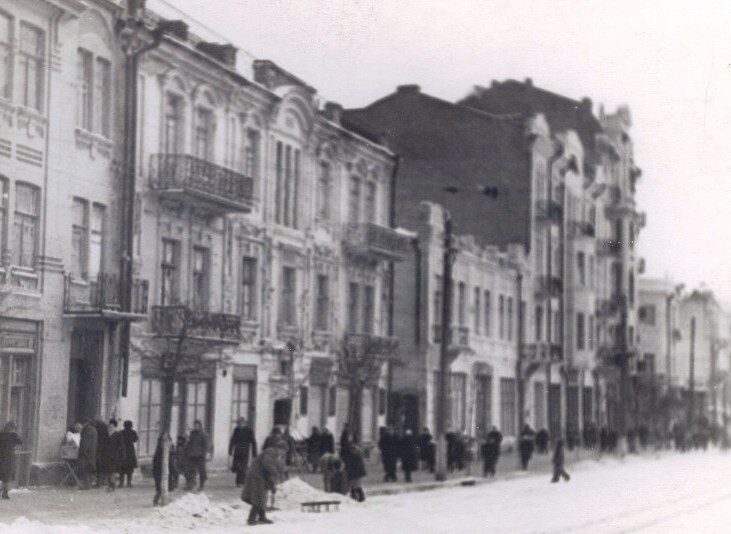 The three SS-led massacres at Vinnitsa took place on the 16 and 22 September 1941 and in 1942, and resulted in the virtual extinction of the town’s large Jewish population. There was one eye-witness to the procedure involved. Lieutenant Erwin Bingel, a Wehrmacht officer was ordered to report to the Town Commandant of Uman, in the Ukraine, and instructed to set up guards on all railways in the area, and around the airport. Vinnitsa during the time Bingel was there. On the 22 September 1941 Lieutenant Bingel and his men witnessed a second massacre in Vinnitsa. This was followed by a third, also in Vinnitsa, carried out by Ukrainian militia who had been trained by the SS, and were commanded by a small group of SS officers and NCO’s. In the first two massacres, Bingel calculated first twenty-four thousand and then twenty-eight thousand Jews were killed. In the third, Ukrainian militia killings, six thousand were murdered. Russian-linked Twitter bots shared Donald Trump’s tweets almost half a million times during the final months of the 2016 election, Twitter Inc. said in a submission to Congress. The information further underscores how Russian-linked accounts sought to stir up discord during the 2016 U.S. presidential election. Congress has been investigating exactly how social-media platforms like Twitter, Facebook Inc. and Alphabet Inc.’s YouTube were manipulated during the election. The documents are Twitter’s response to follow-up questions from the Senate committee following an Oct. 31 hearing on the issue of Russian infiltration of the media platforms. Twitter also found that Russian-linked accounts were responsible for 48 percent to 73 percent of the retweets of WikiLeaks’ Twitter accounts during the same time period. During the campaign WikiLeaks published emails from hacked Democratic party servers. In this further assessment, Twitter said it identified about 2.12 million automated, election-related tweets from Russian-linked accounts that collectively received about 455 million impressions within the first seven days of posting. This is significantly higher than the number of impressions Twitter had previously reported. Twitter also said accounts linked to the Russian government-backed Internet Research Agency exhibited non-automated patterns of activity, such as trying to reach out to journalists and “prominent individuals” through mentions. Some of those accounts represented themselves as news outlets, members of activist organizations, or politically engaged Americans, the company said. Bloomberg News has previously reported that the IRA operated dozens of Twitter accounts masquerading as local American news sources that collectively garnered more than half-a-million followers. More than 100 news outlets also published stories containing those handles in the run-up to the election, and some of them were even tweeted by a top presidential aide. “Some of the accounts appear to have attempted to organize rallies and demonstrations, and several engaged in abusive behavior and harassment,” Twitter said. The new disclosures from Twitter demonstrate how Russian meddlers are complementing their networks of bots with human activity, which the company said makes it harder for Twitter’s algorithms to detect the difference. Twitter previously said it had suspended 3,814 IRA-linked accounts. The company has made several changes to address the manipulation in the past several months. It has banned Russian state media accounts from buying ads and is creating a “transparency center” to show how much political campaigns spend on advertising, the identity of the organization funding the campaign, and what demographics the ads targeted. Facebook told a Senate panel in a written response to questions released earlier this week that it has detected “only what appears to be insignificant overlap” between targeting of ads and content promoted by a pro-Kremlin Russia group and by Trump’s presidential campaign. The company said it “does not believe it is in a position to substantiate or disprove allegations of possible collusion” between Russia and the campaign. WASHINGTON/MOSCOW (Reuters) – Major global technology providers SAP (SAPG.DE), Symantec (SYMC.O) and McAfee have allowed Russian authorities to hunt for vulnerabilities in software deeply embedded across the U.S. government, a Reuters investigation has found. “I fear that access to our security infrastructure – whether it be overt or covert – by adversaries may have already opened the door to harmful security vulnerabilities,” Shaheen told Reuters. Tech companies wanting to access Russia’s large market are often required to seek certification for their products from Russian agencies, including the FSB security service and Russia’s Federal Service for Technical and Export Control (FSTEC), a defense agency tasked with countering cyber espionage. FSTEC declined to comment and the FSB did not respond to requests for comment. The Kremlin referred all questions to the FSB and FSTEC. FSTEC often requires companies to permit a Russian government contractor to test the software’s source code. SAP HANA, a database system, underwent a source code review in order to obtain certification in 2016, according to Russian regulatory records. The software stores and analyzes information for the State Department, Internal Revenue Service, NASA and the Army. “All governments and governmental organizations are treated the same with no exceptions,” the spokeswoman said. While some companies have since stopped allowing Russia to review source code in their products, the same products often remain embedded in the U.S. government, which can take decades to upgrade technology. Security concerns caused Symantec to halt all government source code reviews in 2016, the company’s chief executive told Reuters in October. But Symantec Endpoint Protection antivirus software, which was reviewed by Russia in 2012, remains in use by the Pentagon, the FBI, and the Social Security Administration, among other agencies, according to federal contracting records reviewed by Reuters. In a statement, a Symantec spokeswoman said the newest version of Endpoint Protection, released in late 2016, never underwent a source code review and that the earlier version has received numerous updates since being tested by Russia. The California-based company said it had no reason to believe earlier reviews had compromised product security. Symantec continued to sell the older version through 2017 and will provide updates through 2019. McAfee also announced last year that it would no longer allow government-mandated source code reviews. The cyber firm’s Security Information and Event Management (SIEM) software was reviewed in 2015 by a Moscow-based government contractor, Echelon, on behalf of FSTEC, according to Russian regulatory documents. McAfee confirmed this. The Treasury Department and Defense Security Service, a Pentagon agency tasked with guarding the military’s classified information, continue to rely on the product to protect their networks, contracting records show. McAfee declined to comment, citing customer confidentiality agreements, but it has previously said the Russian reviews are conducted at company-owned premises in the United States. On its website, Echelon describes itself as an official laboratory of the FSB, FSTEC, and Russia’s defense ministry. Alexey Markov, the president of Echelon, which also inspected the source code for ArcSight, said U.S. companies often initially expressed concerns about the certification process. “Did they have any? Absolutely! !” Markov wrote in an email. Markov said his team always informs tech companies before handing over any discovered vulnerabilities to Russian authorities, allowing the firms to fix the detected flaw. The source code reviews of products “significantly improves their safety,” he said. Chris Inglis, the former deputy director of the National Security Agency, the United States’ premier electronic spy agency, disagrees.